Last time I discussed how to make accurate measurements using dimensions already posted on the board. You won’t always have that luxury so slighty different technique is used. 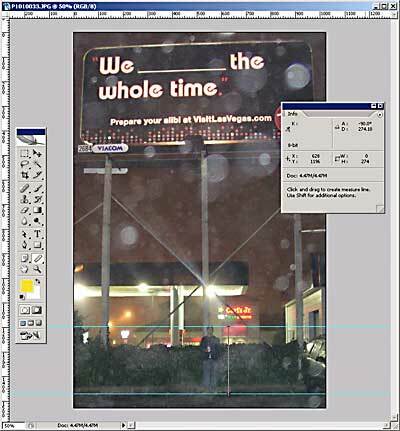 Now you could climb up to the board and whip out a measure tape to get scale but that isn’t always feasible, though it is a good way to get a feel for the billboard before going up. I however like to get the Before shot and the size shot done at once. 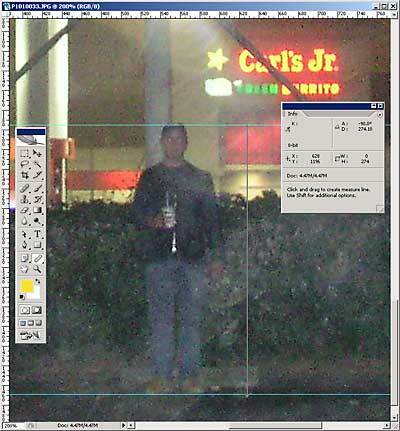 So much like the last HOWTO get a conspirator to take a snapshot with you and the board. Ideally you are directly beneath it or next to it on the same vertical plane for the most accurate measurement possible. Again highest resolution your camera can do, as every pixel counts. Now best to pull some ruler guides in Photoshop from head to toe, then use the Ruler tool to measure the distance in pixels. Hopefully you know how tall you are, I happen to be 5′ 10″ or 70″, in this shot I come in at 274px. So same as last time, whip out a calculator and figure out the ratio of pixels to inches, which in this example is 3.91px/in. Now follow the rest of the step from the first HOWTO, pulling the Ruler Tool across the width of the board and the art you want to improve using the ratio to figure out how large the improvement art must be. This entry was posted on Wednesday, September 28th, 2005 at 12:33 am and is filed under Techniques. You can follow any responses to this entry through the RSS 2.0 feed. Both comments and pings are currently closed.